Masala is back in Bollywood! Oh yes! After what seems to be far too long, here is a Hindi film with all the elements we fell for in the first place – songs, melodrama, romance, over the top fight scenes, good guys, bad guys and lots and lots of explosions. Salman plays Chulbul Pandey, a somewhat corrupt cop, but one who loves his mother – so we know at heart he must be a good person. Chulbul’s widowed mother Naina, in an small but significant role by Dimple Kapadia, married Prajapati Pandey (Vinnod Khanna). Together they have a son who Prajapati favours over his step-son Chulbul. Our hero grows up feeling like an outsider and determines that when he is older, he will be the one with all the power and influence. 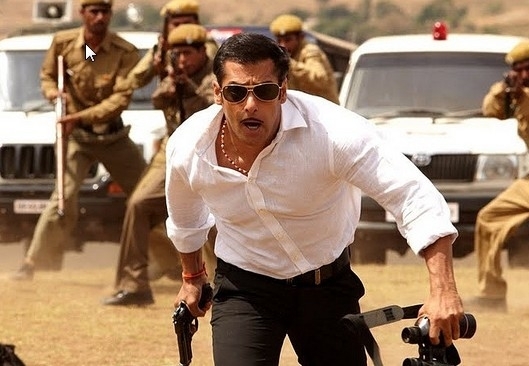 Fast forward 20 years where Chulbul is now a police officer with enough money to buy and sell his step-father many times over (that moderate corruption we mentioned), and a rather thin moustache. Chulbul has a strained relationship with his step-father and spineless, self-centered step-brother Makkhi; Arbaaz Khan with a more robust and unruly moustache and an appalling selection of shirts. Makkhi is desperate to wed Nirmala, but her schoolmaster father cannot afford the dowry Prajapati insists on. Meanwhile Chulbul falls for the enigmatic Rajo, the daughter of a drunk. This is the debut film for Sonakshi Sinha and although she was very lovely there really wasn’t very much in her role for her to work with. But the relationships with her father and brother seemed genuine which added a fuller dimension to her storyline. She did have some very beautiful costumes too! Along the way, Robin Hood Pandey, as he renamed himself, makes an enemy of the chest baring Chhedi Singh. Sonu Sood seems to be making a career out of playing the manically evil antihero – something he does so well – and we do not mind the shirtlessness one bit. Singh is the youth representative for Anupam Kher’s political party, and Chulbul’s policing is cutting into his supply of money from running various shady deals. There is a wonderful item song featuring Malaika Arora Khan choreographed by Farah Khan. This let Salman ruin Sonu Sood’s night while indulging in some excellent uncle dancing and Malaika did what she does best, so this was great fun to see. We applaud a film that condenses political confrontations into a dance. Various plots are hatched and foiled, loved ones die, marriages are arranged and un-arranged, peoples’ values are put to the test. Finally it culminates in a chance to blow absolutely everything up, bare some more chests and let Salman save the day. This is Salman’s film. Perhaps it is the presence of Arbaaz as producer, but Abinav Kashyap really seems to have drawn every last bit of charisma from Salman and used him to best advantage. The action sequences choreographed by S. Vijayan are brilliantly filmed, and manage to give a nod to many great action sequences from recent Hollywood and South Indian blockbusters. Despite having Helen in the family, Salman has never been the greatest dancer. The choreography by Raju Khan and Shabina Khan has cleverly allowed Salman to showcase what he does do well, and the colour and movement of the backing dancers disguises the fact that he really isn’t the most nimble person on the floor. The film does lose momentum after the interval, but soon picks up the pace and the finale has enough action to appease our South Indian accustomed filmi taste. This is a great entertainer of a film. We give it 4 and 1/2 stars! It gets extra points just because we have been suffering Bollywood Masala Deprivation Syndrome and this may be the cure! This entry was posted in Bollywood and tagged Abinav Kashyap, Anupam Kher, Arbaaz Khan, Bollywood, Dabangg, Dimple Kapadia, Hindi, Malaika Arora, Om Puri, Salman Khan, Sonakshi Sinha, Sonu Sood, Vinod Khanna. Bookmark the permalink. 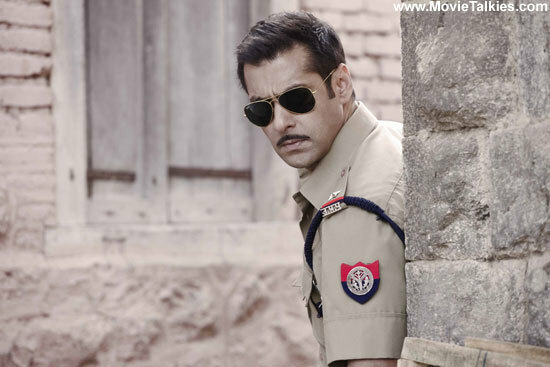 For some mysterious reason, I was thinking about Dabangg when I woke up this morning – and I haven’t even seen it! The two thoughts that linger are 1) what a year he has had, to go from Veer, whose many, many missteps were almost totally his own fault, to this, in which everyone is saying he is all sorts of superlative things, including the sole inheritor of the masala style of hero portrayer (is that a word?) (though we must thank writers and directors very much for this as well, of course), and 2) I think it’s really interesting that the people I personally hear most often talking about the lack of masala in today’s current Hindi films are non-Indians who were not raised on Indian movies, which makes me wonder what movie observers in India think, since in theory they are the intended audience of both Dabangg-type things and the others that we-types have labeled “not masala.” I have some reading to do. As far as I’m concerned, Sonu Sood can take his shirt off anytime! Hubba hubba! @ Beth – I think the reason so many non-Indians bemoan the lack of modern masala is because they didn’t have to live through the 80s. That decade soured the entire country on the concept. You’ve all seen random examples and cult faves, but imagine going to the movies and those horrible things are ALL that you see. And that too for years and YEARS. It’s not hyperbole when they credit the Rajshris for singlehandedly revitalizing theater culture for Bollywood with Hum Aapke Hain Kaun because by that time Bollywood had slipped down a very slippery slope: deteriorating product meant a smaller audience, increasing penetration of video cassettes and TVs translated to a still smaller audience, the terrible violence (sexual and gore) meant women and children didn’t come to the theaters so that cut into the numbers some more -> smaller audience, less money, less care and upkeep of theaters -> dilapidated theaters then cut into the audience even more… it was truly a dark age. Right now there’s a glut of romcoms so everybody likes to complain about it, but there was a time when the arrival of those was hailed as deliverance. I’ve had this conversation with an Indian friend regarding BW in the Eighties. The main reason she stopped watching Hindi films was as a direct result of her mother taking her along to so many of the terrible movies of the time. But after dragging her along a few times with us, she is back in the fold, so to speak, and enjoying Hindi films once more. Great review. Loved Dabangg! Loved Sallu in it! Masala zindabaad! And I am not ashamed ….. I have been in agony with the BMD Syndrome ( and have been sulking for a while ) till Dabangg…but then maybe that’s cos i’m not Indian…just sub continental…hmmm. I think the last time I felt like crying tears of joy at masala was OSO. Do wish Munni song had better sub titles because the lyrics are awesome and mostly in English but subtitler decided to do their own interpretation so ppl who didn’t catch the lyrics wouldn’t have been laughing as hard 😦 Now…i must get back to figuring out how to wolf whistle…had given up for a while but if masala is back I will need this skill for my next cinematic experience! @ Nicki – Thanks 🙂 let us know when your review is up! @ Dolce & Namak – We like to leave some surprises for people to discover by themselves and the Munni Badnaam song might be one of those 🙂 There were lots of references to fight scenes from other films throughout, one example being the panes of glass flying through the air and breaking like Mahesh Babu did in Pokiri. It added to the fun! We had some Hindi film fans with us who had never experienced Southie Masala Greatness – Dabangg may be the film that makes them explore Telugu and Tamil films a bit.